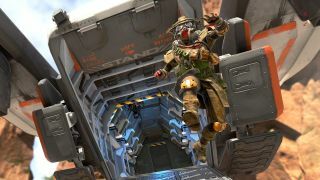 Apex Legends is a free-to-play, squad-based battle royale shooter set in the Titanfall universe, and as we said in our preview, it's good fun even without the Titans. As a free-to-play shooter, Apex is supported by in-game monetization - AKA purchasable characters plus loot boxes full of cosmetics and the like. This model also includes a seasonal battle pass, and while it's still unavailable at the time of this writing, it's clear that the Apex Legends battle pass has taken cues from Fortnite Battle Royale's. EA outlined the Apex battle pass in the official Apex FAQ. As you'd expect, it's "a seasonal system that rewards players with exclusive cosmetic items." As Apex project lead Drew McCoy told us, developer Respawn Entertainment is adamant about avoiding pay-to-win microtransactions in Apex, so everything in the battle pass is cosmetic-only. As such, new Legends - Apex's name for playable heroes - will not be included in the battle pass. It does, however, include Apex Packs, which can yield weapon and Legend skins, banner cosmetics, emotes, and crafting materials. As in Fortnite, Apex's battle passes will be tied to limited-time seasons. The FAQ says each season will last "approximately three months," and that any seasonal items earned will still be available after that season is over. If you don't get the battle pass, you'll be able to earn some seasonal items, but you will need the pass to get everything in that season. The FAQ says "around 100" items will be available for pass owners each season - which, again, lines up with Fortnite's seasonal bounty. The big question is how much Apex's battle pass will cost. For comparison, Fortnite's battle pass goes for roughly $10. It sounds like Apex's pass gets you a fair bit, but at what cost? Not only that, when will the first one become available?